Let me start by stating that I am not a fan of Jazz music !! That might seem to be something of an anomaly as I am attempting to write a short note on ‘Mod Jazz’ for want of a better description! Jazz was something completely beyond my comprehension. I was listening to Elvis, Little Richard, Chuck Berry and Buddy Holly. As the fifties became the sixties subtle changes in the music coming out of the USA became apparent – R&B/Soul music became the chosen music of the new teenage population. We embraced this new musical form with enthusiasm. Raw, exciting, full of emotion – this was the music the emerging sixties generation had been waiting for! London’s clubs and dancehalls resounded to the sounds of Stax, Motown and Chess. There were variations included within the playlists however. Blues and Ska were popular and a more subtle sound gradually wormed its way into our subconscious – Jazz. This was not the Trad Jazz associated with our shores – Kenny Ball, Acker Bilk etc or indeed Modern Jazz/Bebop as propounded by the likes of Charlie Parker, Miles Davis and John Coltrane. No, this was what can best be described as Soul/Jazz. Basically this was Jazz artists playing in a ‘Soul’ style. Whether this was simply a way of expressing their love for all types of music or whether simply a compromising of their talents to attain monetary gain is open to debate. Whatever the reason the results were very popular. A host of artists we would have completely ignored now stoked our imaginations. Records by artists such as Mose Allison and Oscar Brown Jnr became sought after items and many of us elevated the likes of Jimmy Smith and Ramsey Lewis to the top of the tree alongside esteemed artists such as Otis Redding, Sam Cooke and Wilson Pickett. I learned that Jazz was much more than Trad or Modern. There were endless variations and styles and the genre was intertwined in so many ways with what is generally labelled as Soul music. 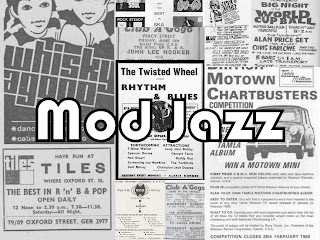 There have been countless sixties ‘Mod Jazz’ compilations over the last few years and whilst there is no denying that they contain some excellent material a great deal of their content is made up of obscure tracks that most sixties Mods would never have heard of? So here is my selection of what is somewhat ‘loosely’ defined as Jazz. These are the numbers I remember from my days as a Mod. I have tried to be objective in that all the tracks are related to what I would term as my Mod years. Not all are personal favourites by any means but to the best of my memory (failing somewhat these days!) all the tracks were ones I remember as being played somewhere or other back in the day. I have taken 1968 as the cut off point. Jimmy Smith – Walk on the Wild Side – 1962 – What can I say – he was simply considered to be the master! I loved this track from the big band build up on side one to Jimmy’s fabulous two note modulation on side two – a master class on the Hammond. King Curtis – Soul Twist – 1962 – The sax ruled alongside the Hammond and King Curtis was without doubt a master of the instrument. He covered the whole gamut of popular music from Rock and Roll to jazz. This was his first record to chart making the top spot on Billboards R&B chart. Work Song – Oscar Brown Jnr – 1960 – Singer, Playwright, Activist and Poet – Oscar Brown wrote this oft covered song for his Sin and Soul Lp. A hugely undervalued artist that had a profound effect on so many musicians. Booker T and the M.G’s – Green Onions - There cannot be anybody out there who is not familiar with this Mod anthem – pure class. I could have included several of their records here – Chinese Checkers ,Boot-leg, Bookerloo – all were so very popular but this side has more in common with the jazz thread here. Brother Jack McDuff – A Change Gonna Come – 1966. Along with Jimmy Smith and Jimmy McGriff he was part of the Holy Hammond Trinity! If anybody ever asks me how an instrumental can be ‘soulful’ I tell them to go away and listen to this! Absolute magic. Ray Charles – Mess Around – 1953. What can anyone say about Ray Charles? Along with Sam Cooke he almost invented Soul music. This is a great slab of Boogie Woogie and one of Brother Ray’s earliest hits from 1953 !!! Junior Walker – Cleo’s Mood – 1965 – Junior was a true Mod legend. It would have been impossible to walk into a club in the sixties and not here the sound of his wailing sax at some stage of the evening! This early recording shows his jazz roots. Esther Phillips – And I love Him – 1965 – Esther Phillips is an acquired taste and to be honest much of her material leaves me cold. She had a hit with this latinesque version of the Beatles song. The story goes that they loved it so much they brought her over to the UK. I have never been able to figure out why I like this song as it represents so much that I dislike but like it I do! Billy Larkin – Pygmy – 1965 – Another Hammond instrumentalist who covered quite a few Soul numbers. This was his first success on a number of his own. Nice one! Bang Bang – Joe Cuba – 1966 - The ‘father of Latin Boogaloo’ He recorded several popular crossover hits but this good time party track was the one that hit the spot here. Mose Allison – Baby Please Don’t Go – 1960 – A classic interpretation of the oft recorded Big Joe Williams song. First appeared on Mose’s Transfiguration of Hiram Brown Lp. Mose Allison was a hugely influential figure on the career of Mod favourite Georgie Fame and it was through Georgie that many of us were made aware of Allison and his material. Johnny Griffin and Soul Groovers – Twist City – 1963 – Originally cut as ‘B’ side of ‘Gee’ on Atlantic. Tenor Sax player Johnny Griffin served his apprenticeship playing behind jazz luminaries like Lionel Hampton and Theolonius Monk before taking centre stage in his own right, Some nice Hammond by Big John Patton. Billy Preston – Greazee Pts 1&2 – 1963. The initial recording for Sam Cooke’s Derby label this was Preston’s first venture on to vinyl. Billed as the 16 year old ‘boy wonder’. It gained later release on Dave Godin’s Soul City imprint in 1968. Billy’s output was always very popular in the clubs and dancehalls. Jackie Mittoo/Roland Alphonso – Dr Ring Ding -1965?. Some questions over the date this was originally put out. It featured on the highly collectable Lp Last Train to Skaville by Jackie Mittoo and the Soul Vendors which first saw light of day around 1968 but a much earlier version (same track) appeared by Roland Alphonso around 65? Whatever - it is a fabulous track – basically a Ska version of Alvin Cash’s Twine Time with Roland Alphonso’s jazzy sax well to the fore. Alvin Robinson – Fever – 1964 – Amongst the countless cover versions of the Little Willie John classic this stands out. Great jazz/blues version on the Red Bird label although it was the ‘B’ side Down Home Girl that became the more popular song. Ramsey Lewis Trio – Uptight – 1966 – Keyboard virtuoso Lewis certainly hit on a winning formula with his ‘live’ jazzy covers of Soul classics. Immensely popular with the Mod population this cover of Stevie Wonder’s classic brought him one of several gold records in the USA. Noble ‘Thin Man’ Watts – Hard Times (The Slop) 1957 – Sax luminary Watts played behind so many great stars – Lionel Hampton, Paul Williams, Dinah Washington, Jerry lee Lewis, Buddy Holly, Chuck Berry – the list is endless. He put out a few fine instrumentals including this which garnered him some degree of recognition. Lou Rawls – Tobacco Road – 1964 To be honest it was the Nashville Teens (1965) hit version of the John D. Loudermilk song that first brought this to my attention. We always made an effort to chase down the original (or in this case alternate) versions of UK covers. A great Jazz/Blues outing. Jimmy McGriff – All About my Girl – 1962. A huge favourite in the clubs back in the sixties – Jimmy McGriff cut some great Hammond led Soul/Jazz sides. A former policeman and childhood friend of Jimmy Smith - McGriff influenced a whole slew of organ led combos. Sam Cooke – Little Red Rooster – 1963. Sam Cooke had a big hit on the US charts with this jazzy version of the Willie Dixon penned number originally recorded by Howlin Wolf. Some great organ playing from Billy Preston. Sam can be heard exhorting Preston at one stage by exclaiming ‘Play it Billy’. The Peddlers – Comin Home – 1968. The Peddlers seemed to guest on just about every entertainment show on TV back in the sixties but their ‘live’ popularity never really transferred to sales. A hugely talented trio that featured the vocals/keyboard of Ray Phillips they had a residency at upmarket Annies Room at one time. This excellent single is very different to the more popular Mel Torme version and even includes some excellent scatting !!! Bill Black’s Combo – Monkeyshine – 1963. Usually remembered as Elvis Presley’s bassist – Bill Black cut several instrumental sides for the Hi label before his untimely death. This is the only one I remember gaining any popularity with the Mod movement due in the main to Ace Cannon’s sterling sax work. Georgie Fame – Yeah Yeah. – 1965. the influence of Georgie Fame cannot be underestimated. His blend of Jazz/R&B/Ska was exactly what the teenagers who thronged the West End every weekend were looking for. His residency at the Flamingo introduced so many teenagers to the music of Mose Allison, Fats Domino, The Markeys and so many others. If such a thing as Mod Jazz exists this would be the prime example. Hank Marr – The Out Crowd – 1966. The ‘B’ side to White House Party on Wingate label out of Detroit. I remember this organ led dancer being played at The Scene (I think! )although to be honest at the time I had no idea what the track was! Ray Charles – In the Heat of the Night – 1967 – Ray Charles really was a genius. I can think of no other artist who could turn his hand to Blues, Jazz, R&B even C&W empowering whichever genre with his own individual stamp. A true legend. This is a great Bluesy number from an equally impressive film. Alexis Korner & Blues Incorporated – Night Time is the Right Time -1964. Following on from Ray Charles here is a fantastic version of one of his hits. The godfather of the UK R&B scene Alexis had been featuring this number in his live act for a couple of years. This version featured the vocals of Ronnie Jones and the sax of Graham Bond from his ensemble – a classic! ( basically a copy of the Beau Dollar version). Oliver Sain also did a particularly nice bluesy take which is well worth checking out. Toussaint McCall – Shimmy – 1967. McCall was something of a one hit wonder in the US. His classic deep Soul ballad Nothing Takes the Place of You reaching the No5 spot on the Billboard R&B charts. The flip side featured McCall on this Hammond groover. Nina Simone – I Put A Spell on You – 1965. Nina Simone was the nearest thing to being the female equivalent of Ray Charles in that she could adapt to Gospel, R&B, Jazz, Blues and make every song her own. Her version of ‘Spell’ is a million miles away from the Screaming Jay Hawkins original and introduced her to the UK charts albeit in the form of a minor hit. Jazz/Blues with SOUL and then some! Lou Donaldson – The Humpback – 1967. Donaldson was a Bop virtuoso who made a move into the Jazz Soul market with some success. His alto sax is supplemented by the organ of Lonnie Smith on this Blue Note outing which garnered some degree of popularity. James Brown and Famous Flames – I loves You Porgy. James Brown always claimed that his particular brand of Funk had its roots in Jazz. People tend to overlook the fact that he was one hell of a singer especially on his earlier material. There have been many excellent versions of this evergreen from Porgy and Bess but JB leaves all the competition standing! Mar Keys – Sack O’ Woe – 1962. Packy Axton along with future members of Booker T.and MG’s and The Packers formed the Markeys with the help of his mother Estelle, part owner of Stax records. They released some excellent Soul instrumentals including Last Night and Philly Dog but this cover of a Cannonball Adderley number demonstrates their Jazz credentials. BaBa Brooks Orchestra – Watermelon Man -1963. A perennial favourite in many forms whether by Mongo Santamaria or Herbie Hancock. However, this Ska version by Baba Brooks ticked all the boxes. First issued in UK on the R&B label. Brooks was a noted Jazz/Ska trumpet player who featured on many of the great sides that came out of Jamaica back in those heady days. Jimmy Smith – I Got My Mojo Working – 1966. The king of the Hammond gives his personal take on the Muddy Waters classic. A huge club favourite. There have been countless versions of this classic (Billy Hawks did a nice Jazz cover) but none come anywhere near the Master. Sandy Nelson – Alligator Boogaloo – 1967. Nelson was a respected session drummer who hit the charts in his own right on a couple of occasions (Teen Beat, Let There Be Drums). In the mid sixties he released a handful of Lp’s with some great Soul covers. This version of Lou Donaldson’s Alligator Boogaloo featured on Boogaloo Beat and was later pulled as a single. Etta James – Sunday Kind of Love – 1961. Originally penned by Louis Prima back in 1946! Etta covered this on her 1961 Lp At Last and made the song her own. One of the greatest female vocalists ever to stand in front of a microphone! Absolute classic. Bobby Moore and Rhythm Aces – Hey Mr DJ – 1966. The ‘B’ side of Searching for My Love which was a one off hit for the band led by tenor sax playing Bobby Moore. A great ‘party time’ record which showed that the band were, in fact worthy of far greater things than their ‘one hit wonder’ status implied. Ramsey Lewis Trio – The In Crowd – 1965. This gained Ramsey Lewis his second gold disc. Again, that winning ‘live’ formula proved a winner although the ‘fade, section in the middle confused the dancers a little! Billy Preston – Billy’s Bag – 1965 . Immensely popular with sixties Mods. Preston achieved iconic status with this record on the Sue label. His talent was immense of that there can be no doubt (a fact recognized by the Beatles). It is a great shame that his personal demons meant he never quite realized his full potential musically. Grant Green – Sookie Sookie – 1965. Green was an established Jazz guitarist with a love of the blues. This 1965 Blue Note cover of the Don Covay number proved popular in some of the more upmarket venues. Zoot Money – The Cat – 1966. Zoot Money and His Big Roll Band were very popular on the club circuit and he shows his prowess on the Hammond with this cover of the Jimmy Smith classic. Miles Grayson – Sweet Bread 1966. Session piano player Miles put out a handful of hard to find singles back in the day including this which went on to become popular on the ‘northern’ scene. Grayson went on to become a respected Arranger, songwriter and producer. Hank Jacobs – So Far Away 1964. Every club worth its salt was spinning this huge Mod sound back in ’64. On the fabulous Sue label that gave us so many great sounds. Googie Rene Combo – Smokey Joe’s La La – 1966. One of the founders of the Class label in USA. He was an arranger, songwriter and producer as well as keyboardist. Googie Rene released a few Rock and Roll numbers in the earlier years before cutting this Ramsey Lewis soundalike. Jackie Mittoo – El Bang Bang – 1964. Jackie was a founding member of the Skatelites and indeed they supply the backing on this Studio 1 side. It also featured on his later collectable Last train to Skaville. Great dancer. James Booker – Gonzo – 1960. One of New Orleans premier Jazz/R&B musicians. Booker had a troubled life with drug problems and a term in Angola prison (seems to have been de rigeur for so many NO musicians. James Brown – Night Train – 1962. Originally recorded by Jimmy Forrest back in 1952 (although there are claims that the tune goes back even further) JB turned the number into a massive club hit. Essential listening for any night ‘Up West’! Billy Larkin and Delegates – Dirty Water – 1966. This was actually the ‘B’ side of a US release – the ‘A’ side being a version of Hold On I’m Comin. The top side wasn’t a patch on this. The Standells original version of Dirty Water was a big favourite being very much in the style of the Rolling Stones. Add the Larkin’s Hammond to that and I was hooked. Willie Mitchell – Take Five - 1966? I have a confession to make – I can remember a funky version of Dave Brubeck’s Take Five being played in a club back in the day. I never found out who featured on the track (I wasn’t a big fan of Brubeck’s original to be honest). Then many years later I heard this version and I am fairly certain this was the track I heard but judging by its rarity I could be wrong!! Anyway it’s a great track. Juggy – Soul at Sunrise – 1966. Great swayer from Henry ‘Juggy’ Jones. Jones was perhaps better known as the founder of Sue Records (along with Bobby Robinson) in NY back in 1957. A multi talented man who was responsible for early output from the likes of Jimmy McGriff and Ike and Tine Turner (managing the pair at one time). Jack the Hat Was Clean – Dr Horse. 1962 There is some debate as to when this side was cut with some claiming that it was as early as 1958? Not that it matters. Another from the US Sue label. I know nothing of Al ‘Dr Horse’ Pittman? A Cooool record very much in the mould of Mohair Sam which made it a must! Packers – Hole in the Wall – 1966. Packy Axton (Markeys) was the primary force behind the Packers who featured Leon Haywood on organ on this side which once again is virtually is ‘tribute’ to Ramsey Lewis (his influence cannot be underestimated). Mose Allison – Parchment Farm – 1957 Mose Allison’s paean to the Mississippi State Prison has been covered by many artists (most notably by Georgie Fame whom I first heard play this). Timeless classic. I can’t help it – every time I hear this I think of Anthony Newley’s Strange World of Gurney Slade!! Cannonball Adderley – Mercy Mercy Mercy – 1966. Lifted from the ‘Live at the Club’ Lp (although this track was actually recorded in the studio!). Cannonball Adderleys biggest selling record making No11 on the Billboard charts. A much covered number which proved popular in all its various guises. Brother Jack McDuff – Screamin’ – 1962 Originally released in the US in 1962 this track eventually got a UK release via the Transatlantic label in 1966. Featuring Leo Wright on sax and Joe Dukes on drums along with Bro Jack’s Hammond. Not my favourite McDuff track (my problem being the dragged out solos) but it was popular. Young Holt Trio – Wack Wack – 1966. Drummer Isaac Holt and bassist Eddie Young broke away from the Ramsey Lewis Trio in 1966 to form the Young Holt Trio along with pianist Don Walker and their initial waxing ‘Wack Wack’ made the lower reaches of the US charts and proved popular with the club going populace on this side of the pond. of the Ray Charles original if that is possible on an instrumental! Ramsey Lewis Trio – Wade in the Water -1966. A perennial favourite that put Ramsey Lewis on the map as far as the sixties teenage population were concerned. Originally a gospel song dating back to the turn of the twentieth century. There have been many other excellent versions – Marlena Shaw, Little Sonny even the Chambers Bros but nothing comes near this classic! Georgie Fame and the Blue Flames – In the Meantime 1965. Another classic from the Uk’s top Mod favourite. Only managed to scrape into the Uk top forty but was very popular with the ‘cool generation’!